First impressions are everything. And lasting. Just ask Kevin Ogletree and the Dallas Cowboys. It was a year ago that the Cowboys' receiver caught eight passes for 114 yards and two touchdowns in the season-opening, 24-17 victory over the New York Giants. Remember thinking Ogletree's star was born? Notsamuch. Turns out he was just a harmless flare, momentarily burning bright before quickly vanishing. 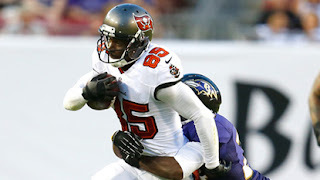 After his dynamic debut, in the season's final 15 games Ogletree managed only 24 more catches for 322 yards and two more scores. He was beaten out by Dwayne Harris for No. 3 receiver, and on NFL Kickoff Sunday will serve the same role for the Tampa Bay Buccaneers. Point is, fans fixate on the season opener from the minute the schedules are released in April. But, ultimately, Week 1 is just a game. Not a tone-setter for five months of football. Ogletree disappeared and the Cowboys finished 8-8 and missed the playoffs. Not that 1-0 is a bad thing. There was a time when the Cowboys always started with a victory. In fact, they won 17 consecutive openers from 1965-81. Recently that's been a difficult task, as they've started on the road eight of the last nine seasons. The Cowboys' only season-opening win at home in the last 14 years: 45-35 over the Giants in 2007. Preview of things to come? Dallas finished 13-3 that season and won the NFC East. But the Giants won the Super Bowl. 10. 9.24.60 Steelers 35, at Cowboys 28 – Cowboys’ late rally falls short in franchise debut in a half-empty Cotton Bowl. 9. 9.15.68 at Cowboys 59, Lions 13 – Don Meredith throws 4 TDS as Dallas establishes record for most points in a game. 8. 9.18.77 Cowboys 16, at Vikings 10 – Roger Staubach scores from 4 yards out in OT to launch a Super Bowl season. 7. 9.12.10 at Redskins 13, Cowboys 7 – Tashard Choice fumbles early; Alex Barron holds late. 6. 9.10.89 at Saints 28, Cowboys 0 – A sobering debut en route to 1-15 disaster for Jimmy Johnson and Jerry Jones. 5. 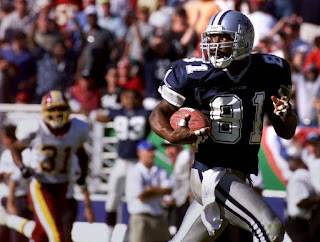 9.12.99 Cowboys 41, at Redskins 35 – Troy Aikman 76 yards to Rocket Ismail in OT caps frantic rally from 21 down. 4. 9.7.92 at Cowboys 23, Redskins 10 – Isaac Holt blocks a punt and Dallas upsets the Super Bowl champs on MNF. 3. 9.8.86 at Cowboys 31, Giants 28 – Herschel Walker scores late for successful, hyped debut with Tony Dorsett. 2. 9.8.02 at Texans 19, Cowboys 10 – Jerry Jones still calls the hapless loss to expansion Houston his most humbling. 1. 9.5.83 Cowboys 31, at Redskins 30 – Danny White’s TD pass to Tony Hill helps erase 20-point halftime deficit on MNF. #1 on the list brings back a lot of memories. For me, seeing rookie (and future HOF'er) Darrell Green run down fast Tony from across the field sticks out. We all said to each other..."who the hell is THAT guy!" "But, ultimately, Week 1 is just a game. Not a tone-setter for five months of football." "Roger Staubach scores from 4 yards out in OT to launch a Super Bowl season."